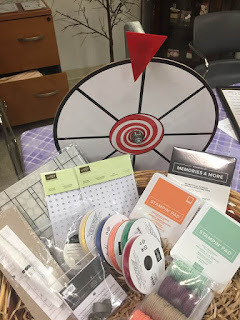 Rubber Room Ramblings: YOU'VE GOTTA LOVE THE PRIZE WHEEL! All of these wonderful Stampin' Up! products will be added to my prize wheel and then given away at the New Catalog Meet and Greet on Thursday, June 6th! Never shopped my BOGO FREE before? Then you are in for a real treat. Those of you who have shopped my BOGO FREE before, you know you don't want to miss it! All of my retired SU! products are on sale! You purchase retired items, and then you get to pick items in the new cataog (of equal value) and order them for FREE! It's amazingly awesome!!!! The fun starts at 6:00 p.m. and the cost is only $5, but you must RSVP by midnight tonight (June 1st).